ISG can supply operations center services or design one specifically for the client’s needs. 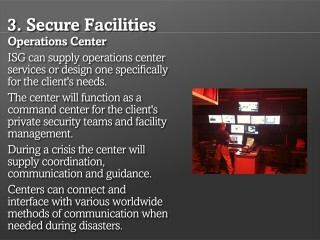 The center will function as a command center for the client’s private security teams and facility management. During a crisis the center will supply coordination, communication and guidance. Centers can connect and interface with various worldwide methods of communication when needed during disasters.